The LIXIL Group supports a systematic and structured talent development program, and encourages all employees to proactively advance their own careers. The LIXIL Group pursues talent development from a long-term perspective in order to nurture personnel who can support the LIXIL brand well into the future. As part of that process, we focus on training next-generation leaders and employees after evaluating global LIXIL personnel based on future business needs. To create a working environment in which all employees can work and contribute enthusiastically, we support career development from two angles: company-driven, strategic career development, and self-motivated career development managed by individual employees. The LIXIL Group holds a People and Organization Development (POD) with its CEOs in all major global organizations, and creates an annual next-generation training plan to cover vital positions and help achieve our Medium-Term Plan. 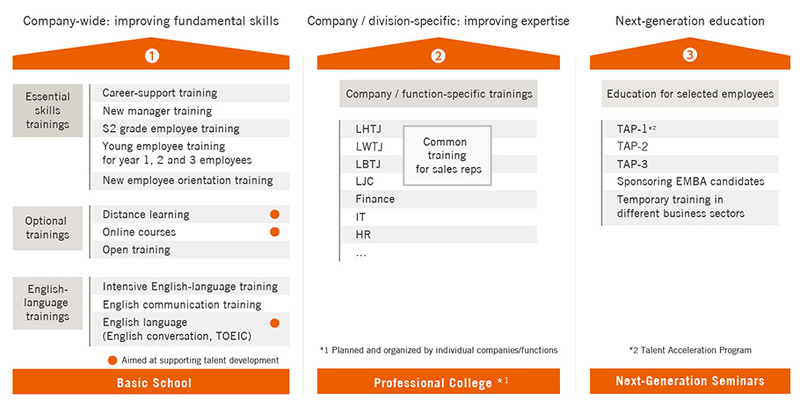 The next-generation training plan includes general development such as seminars, on-the-job training, strengthening of communication skills, and inter-company transfer opportunities, and considers next-generation training from a group-wide perspective in conjunction with multiple departments. In FYE 2018, we conducted the Global Challenge Program, giving openly recruited employees of LIXIL Corporation a chance to learn about our business in an overseas office for a year. Additionally, this international work experience is designed to help foster talent across the Group with the knowledge, experience, career independence, capability, and adaptability required for future global business. LIXIL Corporation’s FYE 2017 career-support training programs are developed for all managers based on the understanding that the best supporters for realizing employees’ career ambitions are their managers. The programs provide managers the right mindset and skills for helping staff develop their careers, as well as for solving daily management concerns. This program was officially launched in FYE 2018. In addition, we support both individual and organizational growth through our open-recruitment job posting system for specific positions. This seeks to improve the movement of company-wide personnel and ensure the optimum placement of employees in order to match the needs of specific departments with employee ambitions. LIXIL Corporation’s talent development consists of seamless education and training programs when an employee is promoted. The programs are designed to improve employees’ basic skills, develop stronger expertise, and nurture next generation managers. We have three types of educational institutions, which are all intrinsically linked. This established training system is designed to ensure young employees in their first through third years of employment can acquire the necessary competences to cope with higher expectations and evolving roles within the company. Our communication skills training for each year group, in particular, focuses on developing the skills required to foster a flat and open corporate culture. Our Talent Acceleration Program (TAP) is designed to proactively nurture the next generation of entrepreneurially minded management personnel, including young employees in their 20s selected by open recruitment or recommendation, middle managers in their 30s working predominantly in the field, and division or section managers in their 40s. We operate different training programs for each of the three groups, focusing on fostering management skills and a managerial mindset from an early stage. We are also introducing an overseas MBA study program to help employees with managerial experience acquire management skills and develop an international outlook.